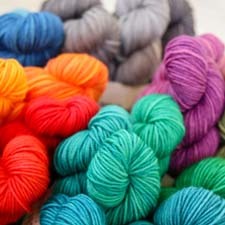 Many new knitters find reading charts to be intimidating, but it’s actually quite easy once you break it down. It’s just like reading written directions. What about all of the symbols? Do they all mean a different stitch? 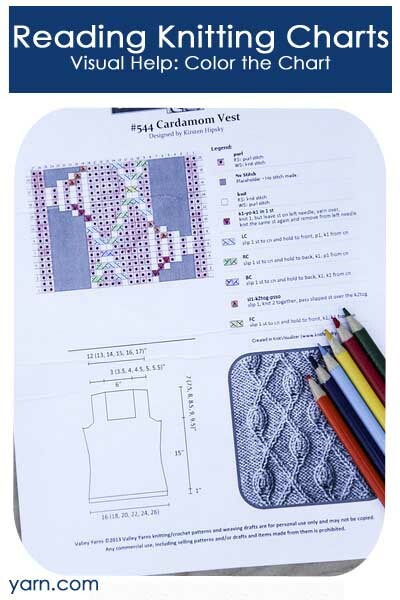 Just like familiarizing yourself with the stitch abbreviations in the written portion of the pattern you’ll want to get to know your stitch symbols. Take a moment to look at the stitch Legend. Every symbol you see in the chart is there and the Legend explains what each symbol means. In most cases, you read your chart from right to left on the first row. You’ll notice that when you’re working a pattern in rows that the Row numbers appear staggered on each side of the chart. If the Row number is on the right hand side of the pattern then this row is worked right-to-left. If the number appears on the left hand side of the chart then this row is worked from left-to-right. When I’m working from charts, I find it really helpful to color the different stitches. It’s easier for me to glance for a color than the symbol. Plus, it’s just fun to color! Often, a chart won’t have the entire piece charted out, just the stitches on either edge and the small section of stitches you repeat across the row. Adding markers at the beginning/end of every repeat makes it easy to keep track of where you are and makes it obvious when to stop the repeat. 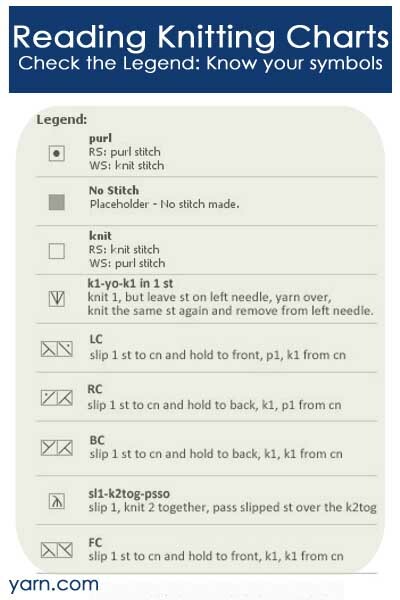 Do you have any tips for reading knitting charts? This entry was posted on Thursday, June 20th, 2013 at 12:13 pm	and is filed under Tips & Techniques. You can follow any responses to this entry through the RSS 2.0 feed. You can skip to the end and leave a response. Pinging is currently not allowed. It’s important to know what the chart assumes about the even-numbered (usually wrong-side) rows. In Japanese pattern books, the wrong-side rows are written as they look from the right side. So if, for example, a Japanese pattern shows a knit st in row 2, that actually is a purl st as you execute the row. Every square is just one stitch/group of stitches. Even a chart with hundreds of stitches is just one stitch at a time.